This was originally posted on the HTC Blog. The first stop on our trip was London and the Abbey Tavern. 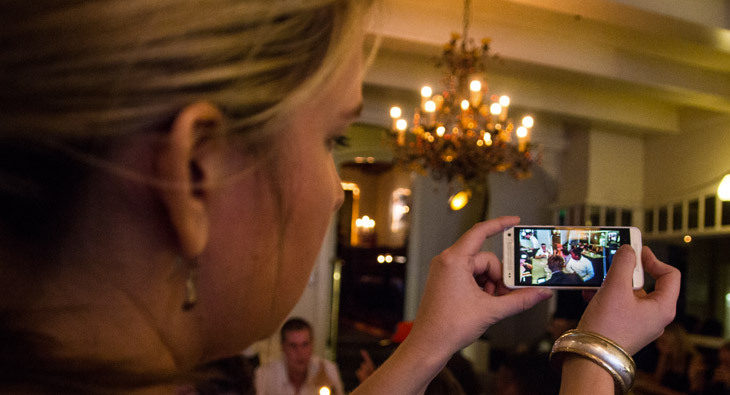 We entered the tavern and snuck through a tight hallway into the backroom where 40 HTC superfans from the London area, and few from as far as Ireland and Italy, were eager for their introduction to the HTC One mini. We spent the night giving them their first hands-on experience with the mini and other HTC devices. They spent the night drooling over the HTC One in Glamour Red, lusting over the Butterfly S, and adding custom music to Zoes they took on the HTC One mini. As the night winded down a group of three musicians sitting at a table pulled out their instruments and started singing. This wasn’t an official show, just three friends hanging out at a bar and jamming. It was a great way to end our first night in Europe. The next day I strapped the mini securely in my backpack and boarded the train to our next stop. While on the train admiring the English countryside, I couldn’t help feeling like I was in a Harry Potter movie. The venue for that night was the Metropolitan, a grand Victorian hotel outside of the core of the city. The interior literally felt like a tavern house from the eighteenth century, with plush, overstuffed wingback chairs and leather couches surrounding large wood tables. It felt very English and was a great backdrop for introducing the latest technology to some of HTC’s top fans. The excitement was evident. Several enthusiastic fans drove nearly four hours to join us. “Oooo, this one’s nice,” he said with a smile, pointing to the red HTC One. In Berlin, we were at Café/Restaurant Neu, a trendy destination tucked off the beaten path. Fans drove hours to get there, some from far-away Romania. We started off with a champagne toast and introductions before handing the mini over to everyone to play with. Just as before, the fans in Berlin loved how the mini felt in their hand and loved taking Zoes. The next morning I had a few hours free before heading off to the airport, so one of our fans, Alex, graciously gave me an impromptu tour of his city. Piling into his Peugeot, he took us everywhere: through the Tiergarten, past the Siegessäule, Brandenburg Gate, to Checkpoint Charlie and the Berlin Wall Memorial, and we even met Maxi, one of the two famous Berlin bears living in a park in the center of the city. Maxi was 27 years old and passed away last week. Thank you, Paul, for showing me your city. Amsterdam is a city of history, canals, bicycles, and tourists. With the narrow semi-circle streets that curve around canals that wrap around the center of the city, there’s barely room for one lane of traffic let alone a taxi, row of bicycles, and pedestrians, most of whom are tourists. The final meet-up was held at Sluizer, a gorgeous restaurant in the center of the city that has a charm of old Amsterdam mixed with modern fare, and an ideal venue to unveil the mini once again. Fans swapped stories about their first HTC device, took Zoes, and compared the size of the mini with their current HTC. In each city, the HTC One mini won the hearts of our superfans. I still can’t believe that some traveled by train, others hours by car, and by airplane from the other side of Europe to join us and see the latest from HTC. Just as our phones work to bring friends and family together, I was thankful that HTC gave this opportunity to bring us and our fans together. I hope you see you at our next meet-up! Thank you very much, London and Manchester. Until we meet again! Vielen dank, Berlin. Bis wir uns wiedersehen! Dank u zeer, Amsterdam. Totdat we elkaar weer ontmoeten! This entry was posted on Friday, August 30th, 2013 at 12:30 pm and is filed under professional. You can follow any responses to this entry through the RSS 2.0 feed. You can leave a response, or trackback from your own site.